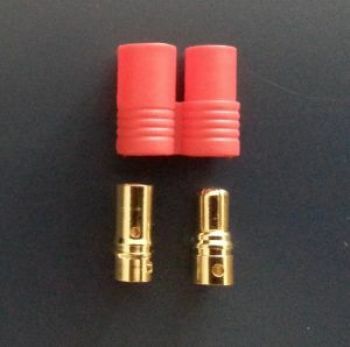 OSE 6mm Gold Plated Bullet connector with red nylon housing are a perfect match for the high current brushless power systems. The included red nylon housing helps stop short circuits. Includes (1) 6.00 Male, (1) 6.00 Female & (1) nylon housing. Order 5 pairs and Price drops to $1.50 each. Order 10 pairs and Price drops to $1.35 each.